Desdemona had been working for the company for almost a year when she decided to have surgery to resolve a long-time health issue. In discussing her plan with Ophelia, the company’s HR coordinator, Desdemona said that she planned on waiting to have the surgery until she met her 12-month FMLA eligibility criterion, which was only a few weeks away. Ophelia discussed the situation with Richard, the company’s executive administrator, who instructed her to send Desdemona home because she was a liability and because the company did not want her to injure herself further and file a worker’s compensation claim for her pre-existing injury. As instructed, Ophelia told Desdemona that she needed to immediately “punch out and go home until [she was] completely healed from surgery.” She also told Desdemona that she needed to schedule her surgery as soon as she could and that she would work with her so that her FMLA would be approved. Ophelia also assured Desdemona that her job would still be there for her when she returned. Desdemona, therefore, requested FMLA leave and had her surgery before her one-year anniversary with the company. Ophelia, however, denied the FMLA leave request, because Desdemona did not meet all the eligibility criteria. If Desdemona had simply taken off for her surgery on her own prior to becoming eligible for FMLA leave, and had not been instructed to do so by the employer, the employer would be on solid ground. The HR coordinator, however, encouraged Desdemona to move her surgery up and assured her she would receive FMLA leave and her job would be waiting for her, and Desdemona acted on that information to her own detriment. One of the takeaways from this case is that employers should not make FMLA promises they cannot keep – such as promising the law’s protections before an employee is actually eligible for them. If an employee has not met the FMLA eligibility criteria, don’t try to apply the law’s protections, particularly if you’re going to make the employee angry enough to file a suit. An employee may take non-FMLA leave before he or she meets the eligibility criteria. In this case, the upset employee in this case went after not only the company, but also the HR coordinator. This article was written by Darlene M. Clabault, SHRM-CP, PHR, CLMS, of J.J. Keller & Associates, Inc. The content of these news items, in whole or in part, MAY NOT be copied into any other uses without consulting the originator of the content. 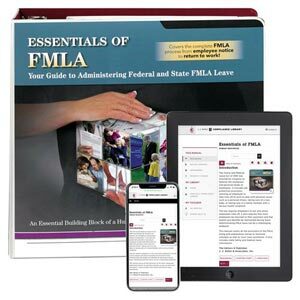 J. J. Keller's Essentials of FMLA manual walks you through Family and Medical Leave Act requirements.